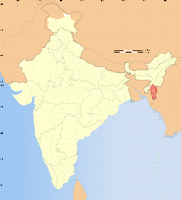 Neighboring States: Tripura, Asom, Manipur, Country, Myanmar. 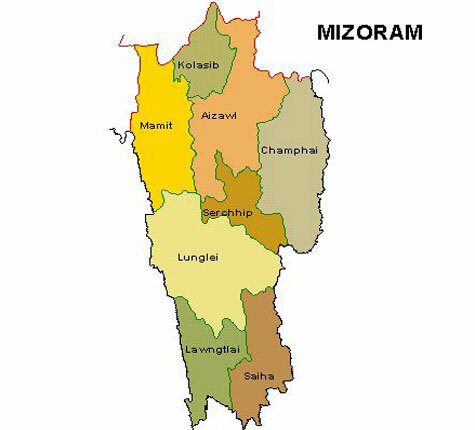 Main Political Parties: Mizo National Front, Indian National Congresss, Mizoram People’s Conference, Zoram Nationalist Party, Hmar People’s Convention, Maraland Democratic Front. Seat of High Court: Guwahati: A bench at Aizawl. (b) Mountains: Mizoram is a land of hills, the bighest point being the Blue Mountain (2165 metres). (b) Agricultural Products: Maize and paddy. Pulses sugarcane, chilies, banana, ginger, potato, tobacco, vegetables, turmeric and pineapple are the other important crops. (c) Crafts: Puans woven on traditional looms, thi-hi (amber bead necklace), Darhi (glass bead necklace), shawls, cane and bamboo works, Lunglei, Chintapai, Vakiria (headgear).